This Orgone Necklace was created with the intention to bring peace, love and harmony into your environment. It has Merkabah symbol imprinted on it. Merkabah, also spelled Merkaba, is the divine light vehicle allegedly used by ascended masters to connect with and reach those in tune with the higher realms. "Mer" means Light. "Ka" means Spirit. "Ba" means Body. Mer-Ka-Ba means the spirit/body surrounded by counter-rotating fields of light, (wheels within wheels), spirals of energy as in DNA, which transports spirit/body from one dimension to another. The Merkaba enables us to feel unconditional love thus healing ourselves as well as others. It gives us the possibility of creating any kind of harmonious reality we desire. The Merkaba can be "programmed" to do anything (the only drawback being our own belief and imagination). The Merkaba is also a tool that can be used to transcend into other dimensions. This powerful little jewelry piece is not only meant to be a pretty accessory, but also created to provide strong EMF protection and free your space from any radiation from your phone or computer, or from any negative energy in your surroundings. This orgonite's best use is to clear any negative energy, keep it by your side during meditation, set it by your bed side, or near any electric devices to clear the radiation from it. Wearing this necklace will help you in balancing and harmonizing chakras, while connecting mind, body and spirit as one, activating your Chi channels and clearing all the negative energy in your body and around you. It will bring love, awareness and luck into your life. It contains 4 Rainbow Aura Quartz Crystals wrapped in copper wire, Rhodocrosite, Sodalite, Amazonite, Malachite, Shungite powder, Sage, Rose Petals, Mica Flakes, 24 K gold flakes, Metal shavings, Copper coil, Black Sun Iron Oxide nano powder, jewelry grade epoxy resin. Comes on a FREE 18" cord necklace with lobster clasp. If you don't like the necklace simply change it for one of your own. It could be easily removed. 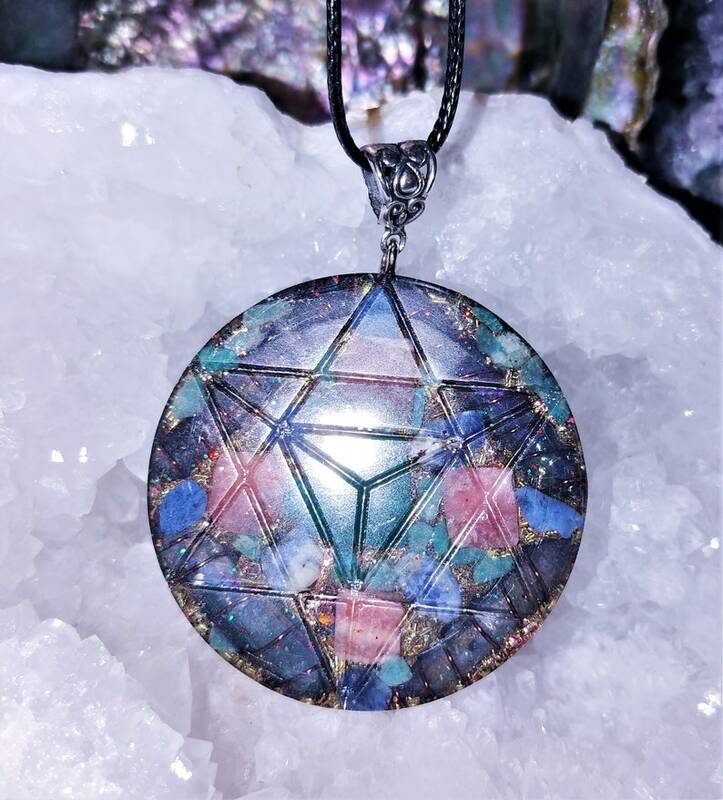 All the crystals used in this necklace were cleared in ocean water, charged on sun light and moon light, and enhanced with the power of Divine Reiki Energy. It was also treated to vibration of Love and Light ~ 528 hz~ while curing. Rainbow Aura Quartz, also called Angel Aura Quartz or Opal Aura Quartz, cleanses the aura and can facilitate deeper and higher levels of meditation. A peaceful and tranquil stone, Rainbow Aura Quartz is useful for communication with Angels, Spirit Guides, and other Teachers. Having such a fine vibration, Rainbow Aura Crystals also allow the user to clear away negativity that has previously been resistant, and helps to gently raise energy levels in those who are feeling depleted. Rainbow Aura can help to release negative emotions such as resentment or grief. Rainbow Aura is a perfect piece to use when facing a dysfunctional type of relationship, bringing a deeper insight into the relationship and the holder's part in it. Meditating with Rainbow Aura Quartz can be beneficial for those who are going through stressful or otherwise negative situations. Rainbow Aura is wonderful for meditation, gridding, and healing work. Carrying or wearing Rainbow Aura will help when encountering negative or stressful situations, removing that energy and replacing it with loving, positive vibrations. Use Rainbow Aura to enhance the healing properties of other crystals. Rhodochrosite is a strong stone to aid emotional healing. It encourages you to feel love for yourself, and its energy will assist you in meditation, to reach a state of joy and sublime happiness. It's energy may stimulate your inner child, and bring a deep childlike happiness and joy into your life. If severe childhood events have also stopped you from allowing wonderful innate gifts or talents to emerge, it may aid you to allow these to develop, and may bring deep forgotten memories to the surface for healing. Pink Rhodochrosite is a powerful heart chakra stone, and like most heart chakra stones vibrates with the energy of love. In this pink crystal, the love energy is directed towards your own self. They are particularly active stones energetically, especially to heal you if you don't have a good opinion of yourself. Sodalite stone has a strong vibration that is particularly helpful to aid the development of psychic abilities and with developing intuition. This stone may help you if you are doing public speaking and is excellent to aid communication generally. It has strong metaphysical properties that may stimulate latent creative abilities and it aids teachers, writers and students to understand the deeper philosophical principles. It will bring your attention to the qualities of idealism and truth and its energy may stimulate you to live up to your own ideals and ideas, about the nature of truth. This is a strong third eye chakra and throat chakra stone that brings an excellent energy into your life. Within the third eye chakra area is where the pineal gland is located. To assist with the development of psychic gifts, working within the third eye with Sodalite stone has a strong ability to accelerate the process. It will aid you to develop your intuition, and it will also stimulate the birth of clairvoyant abilities, or strengthen them if you already are using these gifts. This stone has a vibration that aids truth, and helps you to better understand the life you are living, and how you came to be in the situation in which you find yourself. Called the Stone of Courage and the Stone of Truth. It empowers one to search the self and discover one’s own truths and integrity, it provides the freedom to express one’s thoughts and feelings, and to set strong and clear boundaries, both internally as self-discipline, and externally on what one is willing to experience or in defining personal space. Known to ground EMF and protect the physical body. Amazonite is deeply stimulating to both the Heart and Throat Chakras. Green crystal energy is used to resolve blockages and to re-balance the Heart Chakra, helping us understand our own needs and emotions clearly. The Throat Chakra is the voice of the body. Amazonite helps to communicate our ideas, beliefs, and emotions, bringing our personal truth out into the world. It helps us to have an easy flow of energy within the body and spirit. The energy that springs upward from the lower chakras can continue its path enabling free expression and natural release. Blue crystal energy will unblock and balance the Throat Chakra. As a stone of transformation, Malachite encourages change and emotional risk-taking. It shows what is blocking your spiritual growth, draws out deep feelings and psychosomatic causes, then allows you to break unwanted ties and outworn patterns. It encourages the expression of feelings, alleviating shyness and teaching the responsibility for one's own thoughts and actions. It supports friendships and empathy for other people. Malachite helps battle depression and anxiety, gives resistance to emotional blackmail and heals emotional abuse, especially when suffered in childhood. It also encourages healthy relationships based on love and not need. Malachite assists in overcoming fear of confrontation, or fear of being seen or noticed, and helps one find the strength within to assume their rightful place in the Universe. Shungite is believed to be over 2 billion years old. Shungite is the only crystal known to naturally contain fullerenes aka Buckyballs, a hollow carbon structure which is said to give Shungite its healing properties. Shungite has electric conductivity properties. This is said to be the reason for one of shungite's most notable uses: shielding and protection from EMF electromagnetic radiation from things like TVs, computers, microwaves, cell phones, and other items. This shielding brings with it many healing energies. Shungite is an excellent stone for magickal and mystical work. It grounds spiritual energy to bring it into the Earth plane existence. Shungite is also used to bring Light into the auric energy field, allowing positive energy only to reach within that field. This brings not only physical protection, but also psychic protection. It is said to be protection against the evil eye and negative energies. Shungite is said to calm and relax anyone using or near it. This may be due to its protective energies and rejection of negative energy. Shungite is used in crystal healing and It is considered by many to be a miracle healing stone. Shungite is related to the root or base chakra. Traditional symbol of love, rose petals also known as a symbol of inclusion, universal understanding and order. ... In mythology, rose meaning is associated with Aphrodite (Greek) goddess of love. Sage is known to have healing properties and with the power of intention and spiritual connection with the source of all existence. Sage is used for it healing and clearing purposes. It is believed that the scent of the Sage is intolerable to lower energies (lower frequencies, lower vibrations, negative energies, bad energies, evil spirits, spiritual curses, & etc.) and at the same time aids to restore, balance, detach unhealthy attachments (behavioral patterns in relationship of all kind, addictions, & etc. ), and to raise and attract higher energies, frequencies, and vibrations. Copper is helpful for balance, communication, and synchronicity. Copper is a great conductor of energy and is useful for all types of spiritual purposes. Connecting with the crystals, Copper can smoothly transmit their energies to the holder, communicating knowledge from higher realms to the conscious and subconscious mind. Copper is a popular tool for healing and works with all of the Chakras to pull in energies from higher realms into the physical world. In healing, Copper works to bring those higher energies into every cell for the remembering of the original state of perfection. Mica is said to help eliminate negative personality traits by helping one recognize them. It is said to enhance flexibility in all realms and also assist growth in those areas. It is used to diminish anger, hostility, and nervous energy. Mica aligns energy of the body and releases blockages of energy within the body. Physically, mica is used in crystal healing and folklore to reduce hunger when fasting, insomnia, mononucleosis symptoms, dehydration. It is also said to provide energy and purpose. When used in orgonite pyramids and pendants, it is greatly increasing the energy clearing and activates positive energy field. Metal shavings (a conductive material) are bound in and separated by resin (a non-conductive material). Natural crystalline stone interacts with these materials to produce the electrostriction effect that greatly enhances the transmutation potential of the compound. Intimately linked with Divinity and those gods associated with the Sun. Symbolizes the purity of spirit and they attribute the power of cell regeneration, energy conductivity, communication transmission and energy purification to the metal. The power of the Tesla coil lies in a process called electromagnetic induction, i.e., a changing magnetic field creates an electric potential that compels current to flow. It helps greatly in the process of clearing of the energy and transmuting it into the energy of love, light and happiness. Orgone Accumulator is a substance which functions as a self-driven, continuously-operating, highly efficient energy transmutation device, drawing in negative life energy and transmuting it into positive energy. It is reputedly protects one from harmful EMF radiation. Some people feel increased energy and a greater sense of well being when wearing or being in the vicinity of orgone product. Orgone Accumulating Device is made with metal shavings and epoxy resin. Quartz and copper are popular ingredients due to their conductive properties. The resin is poured over the quartz and metal shavings, and it shrinks as it hardens, exerting pressure on the quartz, permanently squeezing the quartz crystal inside which creates a well-known piezoelectric effect inside the crystal, meaning its end-points become polarized electrically, this apparently causes it to function more effectively as a positive energy generator. Having an orgone product on you is like having an energy transformer in your energy field. It will clean up stuck or armored energy structures in your energy field. Of course, how much it will be effective also depends how old and strong the armored energy structures are. Orgone Device can be effective immediately or it might take a long time. But it is always working. How to identify that Orgone Accumulating Device is working? Sensitive individuals will feel the heat and light tingling radiating from the Orgone Device. Some people may experience increase of energy levels. Orgone is believed to be beneficial to one's physical and spiritual energy field but my orgone products are not intended to replace a physician's treatment or advice. I am not a doctor and cannot give out medical advice. Orgone, crystals and energy healing should be used as a compliment to other therapies and not as a replacement for regular medical care. Please keep in mind that every orgone accumulating device is a handmade resin product, during the curing process some inclusions, imperfections, bubbles or texture variations can occur but this in no way affects the quality or function of the orgone device.